High-altitude trekking can mean some pretty awful eating, especially if you pack along those freeze-fried meals. Those are never very palatable under the best of conditions, but at an 11,000-foot base camp, they are a recipe for runny eggs and really sloppy slop. Please click here to view the Jan 5, 2014 updated version. Because the temperature at which water boils gets lower the higher you climb. At 11,000 feet, water boils at 191 degrees (F). That's low enough so that it cools much faster when you pour it into a pouch of freeze-dried food. This means that the water never completely re-constitutes the dried food, leaving it runny, gritty and unpalatable. I have found this even worse during winter backpacks in the Sierras where it can be far below zero at 11,000 feet. Boiling water barely thaws the freeze-dried stuff and fails to reconstitute it. Sure, you can always take a pot, partially reconstitute it there and then try washing the pot afterwards. That does mean that I am packing water up the mountain. But I have found the extra weight worth the effort. I heat the MRE pouch in the boiling water, eat it from the pouch, collapse the pouch and stick it in my bear-proof container for backpacking the trash out. Yeah, I do have to wash my long-handled, titanium spoon. Which you can do in the snow if needed. No freezing fingers required. As an added benefit, I have found all the MREs palatable. All are better than you can get at a chain restaurant like Applebees and some are actually really, really good. After two decades of scientific research showing that trans fats will help kill you (Mayo Clinic: Trans fat is double trouble for your heart health) the FDA has continued its tradition of leading from way behind and has slouched toward banning them in civilian food (FDA moves to take trans fat out of food). And almost everything in the familiar plastic pack contains partially hydrogenated oils (Trans fats) of one sort of another because those help extend the shelf life of the food long enough for archeologists of the year 3013 to find them as safe and yummy as ever. But, let's face it: going mal- and un-nourished in country for an extended time saps energy and concentration and makes you an easier target. And there's no argument that enemy incominwill kill you a lot faster than a heart attack. However, most members of the armed forces are the staff of the spear and not the point. 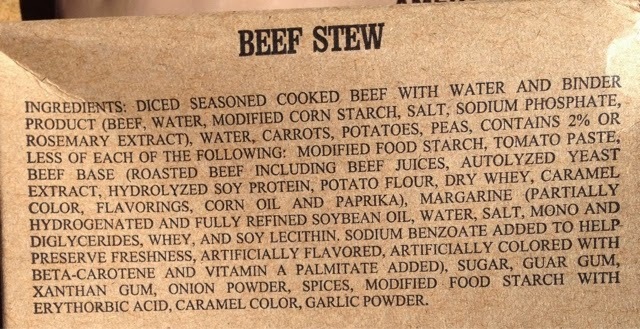 This means that the chow served should be as healthy as civilian fare. 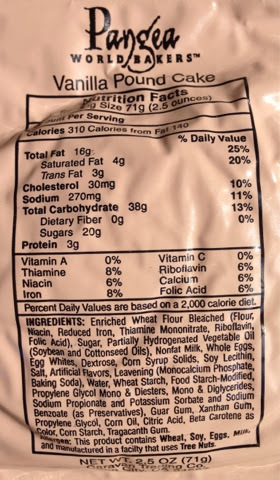 FOBs, obviously don't have cafeterias, but whenever you can, avoid the trans fats in MREs and other foods otherwise you're in the crosshairs of the enemy within. Here's a look at one MRE pack: Menu 9. 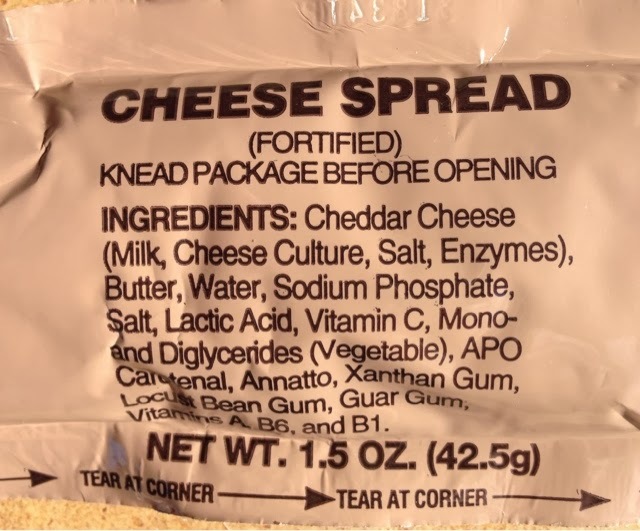 Everything has partially hydrogenated oils -- trans fats -- except the jalepeno cheese spreads which is one of my favorite breakfast treats. 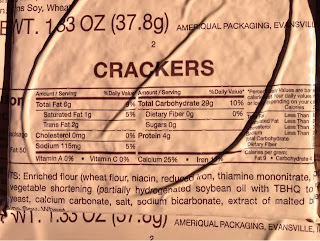 Sadly, that's usually spread on the cracker. 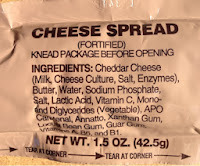 Clearly, I eat the MRE when needed. And avoid the trans fats when I can. Balance is everything.